On the eve of my departure for another hemisphere, another continent, another season, I dug and pulled and lifted and fertilized and sowed. 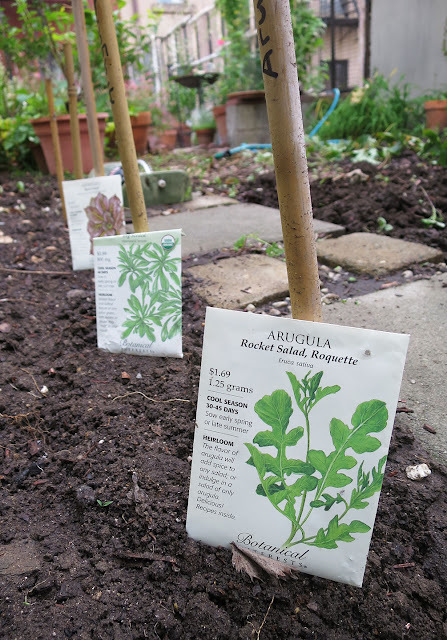 I have little doubt that my fledgling fall crops (arugula, mache, mustard and a squash wild card - the fava beans and peas must wait till I return) will be overwhelmed with invigorated weed seeds by the time I return in mid September. But it had to be done. Our house is still half-boxes, and the garden is just an idea, but I can't let weeks pass without some investment in the soil. After a week and a day in residence we feel suddenly at peace after almost two years on eggshells. I had not expected such a sudden dialing down of tension. The nervous energy and uncertainty of our Harlem building have gone. Our new building is quiet. These streets are quiet. It is days between sirens. Our landlord is responsive and low key and a good man. Thank you to everyone who has sent us messages of support during the upheaval of our move. The last few weeks have not been easy, but we are beginning to see the shape of things to come. YES!!! I am so happy for your newfound peace at your newfound home. The street looks so dreamy. How wonderful! You feel that this right. I am so glad. Terra firma. Welcome to ground level. And of course you planted - those are essential roots. How lovely you're feeling peaceful and connect to your new space! Hope your trip is very enjoyable and without some of the drama that goes with travel. how wonderful to see seeds planted... have a good trip! So happy for you, liking the shapes to come! It feels that you have deeper roots in Brooklyn. I look forward to seeing your home and garden become something lovely for you. Safe travels. So happy for you two to find peace and contentment in your new home! Good to hear that you are settled and at peace. I was on eggshells too while you were living uptown! Looking forward to your fall crops (and mine too!). Have a good trip. How lovely to travel with all of this waiting for your return. Such anticipation! Thank you for sharing all of this with us. Now we feel your peace. Your new home looks just beautiful, and you will make it even better. So happy for you and the Frenchman. Sub-title: Uptown Girl Comes Down to Earth. What a wonderful post and I can completely relate to the peace that is found in a quiet home. It makes a tremendous difference in your daily well being - you are no longer waiting for the other shoe to drop. Safe travels and enjoy your time with your family. I've been out of the loop on everything for the last three weeks dealing with out last parent. Sifting through sixty years of a married life is heartbreaking. Having lost two parents to dementia I feel for what you're dealing with. Your mother is especially in my thoughts. It is soooo heartrending. I guess you are back where you belong. How wonderful! Planting something before you left on a very difficult trip is a very hopeful thing to do. I'm so happy about your new place and the sense of peace you feel about it all. Can't wait to see what you do with the garden and look forward to pictures of your beautiful meals. How wonderful. I just planted some mache and bok choy myself, maybe some mustard greens will go in some time soon. Now the peas and fava beans are intriguing. Can you really plant them in the fall, the way they do in Mediterranean climates? Love the look of your new outside space. I've just moved too. Old Victorian terrace with a tangled garden/jungle covered in brambles and bindweed. And I am loving the delight of discovery and the joy of allowing light and space back in. I hope you enjoy yours just the same.